Home / GST-Tally / TallyERP.9 Lessons / How to Create Nil Rated Sales Invoice under GST in Tally? 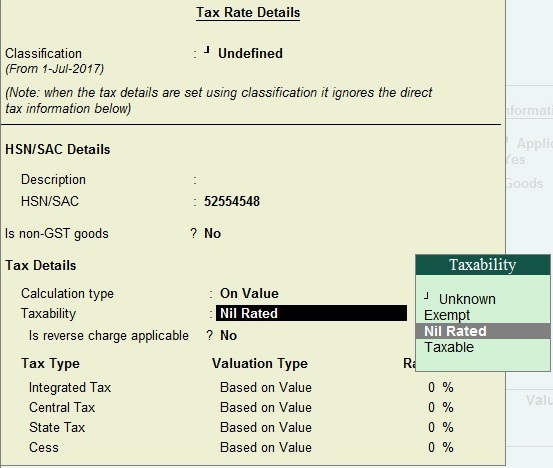 How to Create Nil Rated Sales Invoice under GST in Tally? Before we learn about how to create a Nil Rates Sales voucher in tally, we know about Nil Rated supply under GST? As per Section 2 (44) of drafter Model GST Act, “exempt supply” means supply of any goods and/or services which are not taxable under this Act and includes such supply of goods and/or services which attract nil rate of tax or which may be exempt from tax under section 11. For your information, you must have configure inventory for all kind of invoices generated by tally under GST Regime. 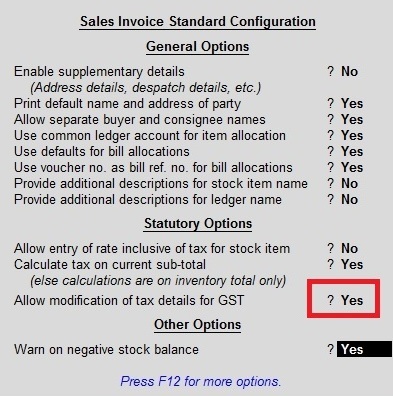 For creating stock item read this: Update Stock Item & Stock Group for GST Invoice. When you create an stock item Select GST Applicable, Set/ Alter GST Details to yes and define the stock item as Nil Rated and you will again switch to stock item creation screen. Press Enter to Save. Select yes to Allow modification of Tax Details for GST. This option allow you to select the nature of transaction under sales. If you sale taxable sales then you have to select taxable sales from the list of predefined nature of sales or if you select nil rated then you have to select nil rated from the list. Press enter to save your Sales Voucher. Now go to Gateway of Tally - Display - Statutory Report - GST - GSTR - 1. You can see the Table No. 9 is for Nil Rated Invoices and your Invoice will be appear in Nil Rated Category.